Moist and fluffy flourless banana blender muffins! They are SO easy and you can add all of your favorite mix-ins like nuts, coconut flakes, cinnamon, or chocolate chips! Preheat oven to 375. Grease muffin tins or place muffin/cupcake liners in the tins. Add oats, eggs, brown sugar, baking powder, baking soda, vanilla, sour cream (or Greek yogurt), salt to a high powered blender. Pulse until smooth. If you are using just one mix-in (i.e. : chocolate chips) then you can stir it right into the blender (with a spoon- don't pulse) and then fill muffin tins 3/4 full. 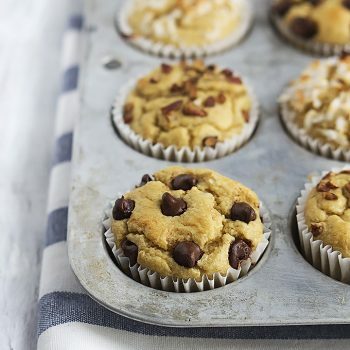 If you want to use more than one mix in (such as chocolate chips on some, and coconut flakes on others) then fill the muffin tins first, then sprinkle your mix-ins on top of each cup and stir in with a knife. Bake for 10-15 minutes or until golden brown and an inserted toothpick comes out mostly clean. Allow to cool completely, store in airtight container.